As Soho launches go, it was a good one. Helped by the copious supplies of Millers Gin, a fashion and art crowd mingled with former Colony Room members, partying to celebrate the unveiling of 15 new works (‘A Passion for London’) by artist Paul Jack Hiles, at a growing venue for edgy artists launching new works, Reading Room in Frith Street, London. Since his original student days watching Henry Moore sketch and work, Hiles’ work has developed particularly over the past four years, focussing on detail, London life and humour. 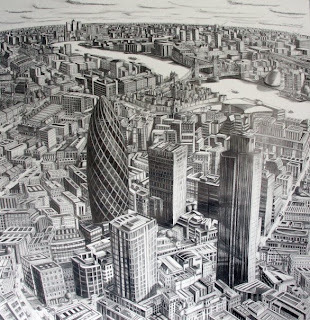 Concentrating on detailed London scenes, Hiles incorporates well known landscapes such as St Paul’s and Tower Bridge and features trademark red London buses – a humorous and distinctive light touch to the pencil drawn, intricate black and white pieces of work. Some are large in scale and full of quirky details such as “Jack the Ripper” hiding down a dark alley in Spitalfields, Boris on his bike next to City Hall or Anne Boleyn being beheaded on Tower Hill. The intricate yet hectic nature of the work resonates with all London dwellers – the appeal in the detail, richness and scale. These are the works destined for Hedge Funds, Banks, restaurants and conglomerates in the Capital…as well as the London collector with a huge living space. Next post: A Fragrant Affair.